When you want a new look for your smile, porcelain veneers deliver. Porcelain reflects light in much the same way natural teeth do, so there’s no need to worry about having a “fake-looking” smile. We make sure to custom match the shade and shape of your veneers to your natural teeth, thus blending your porcelain veneers with the rest of your look. And porcelain resists stains, giving you a long-lasting, whiter smile. Whether you see Dr. Mauck or Dr. Ricci, both will want you to be directly involved in the creation of your new smile with dental veneers. Of course, there will be parameters based on the size and shape of your mouth, the structure of your face and even the color of your complexion. Nevertheless, your smile goals are an important consideration. To help the doctors, feel free to bring in photographs of celebrities or friends who have smiles you like. Once you and your Aurora cosmetic dentist decide that porcelain veneers are the right treatment for you, you’ll need to schedule two appointments to complete the process. 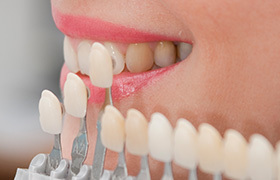 At the first visit, we’ll prepare the teeth that will be getting veneers. After numbing the area with a local anesthetic, we’ll remove some of your tooth enamel. This way, your veneers will not make your teeth look too thick. After this, we’ll take an impression of your teeth so our dental lab is certain to fabricate veneers that fit comfortably. This impression is also what our office will use to immediately make you a set of temporary veneers for you to wear while your permanent set is under construction. At the second appointment a few weeks later, your temporary veneers will be removed, so we can cement the permanent veneers in their place. Before doing so, however, the dentist will make sure each one is perfect in size, shape and color. Porcelain veneers fix cosmetic issues with your front teeth. If your back teeth are in need of repair, porcelain crowns can help. Let Dr. Mauck and Dr. Ricci design your new smile at our Aurora area dental practice today!